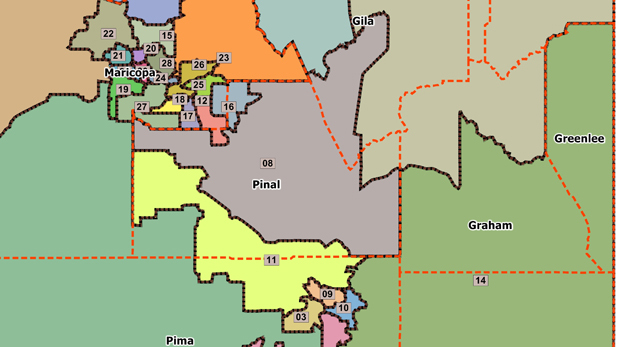 / Modified nov 7, 2016 11:31 a.m.
Arizona legislative districts, as drawn by the Independent Redistricting Commission in 2011. Seven of Arizona's 30 legislative districts are in Southern Arizona, and while that's not enough to hold sway in the state House and Senate, it is expected to be influential. Each district has two House seats and one Senate seat. Incumbents in four of the seven Senate seats sought re-election and have competitive races, and six of seven districts have competitive House races. In southern Pima County's 2nd Legislative District, incumbent Democratic Sen. Andrea Dalessandro faced small-business owner and Republican Shelley Kais. In Central Tucson's 10th district, incumbent Democratic Sen. David Bradley was challenged by Republican Randall Phelps, an aviation industry consultant. Incumbent Republican Sen. Steve Smith faced Democrat and U.S. Postal Service retiree Ralph Atchue in the 11th district, touching northwestern Pima County and covering part of Pinal County. In the 14th district, in eastern Pima County and covering much of Cochise County, incumbent Republican Sen. Gail Griffin faced retired auditor Democrat Jaime Alvarez. In the 2nd Legislative District House race, incumbent Republican Chris AckerlyRosanna Gabaldon faced challenging Democrat Daniel Hernandez, a member of the Sunnyside School District Governing Board. In the 3rd district, incumbent Democrats Sally Ann Gonzales and Macario Saldate ran against University of Arizona graduate student and Green Party challenger Edward “Trey” Cizek. The 9th district’s race featured a lone incumbent, Democrat Randy Friese. The race’s challengers were Democrat Pamela Powers Hannley, a retired public relations professional, and Republican business owner Ana Henderson. The 10th district also had a single incumbent. Democrat Stefanie Mach sought a third term, while Democrat and UA Law Professor Kirsten Engel and Republican businessman Todd Clodfelter ran for the first time. The race for the 11th district featured two incumbent Republicans, Mark Finchem and Vince Leach. Democrat UA graduate student Corin Hammond challenged them. Both incumbents in the 14th district reached their term limits, making it the lone legislative race in Southern Arizona with no incumbent. The Republican candidates were Graham County Supervisor Drew John and businesswoman Becky Nutt. The Democratic candidates were retired Army officer Mike Holmes and Cochise County prosecutor Jason Lindstrom.